RESIDENTS OF OXNARD, EL RIO, SANTA PAULA! HAVE YOU EVER WONDERED WHAT KIND OF PESTICIDES ARE USED ON CROPS NEAR YOU? NOW YOU CAN FIND OUT! To receive information about the kinds of pesticides used near you, send a text with the word “pesticide” to 877-877. The growers who run California’s strawberry industry have grown addicted to dangerous pesticides, and have shown no sign that they want to stop; this is the case even though they are aware of the serious risks that the use of pesticides cause to the environment (the ozone layer) and the general population. Without any remorse, workers are exposed to chemicals like Methyl Bromide, 1-3, Dichloropropene, and Chloropicrin, which cause headaches, dizziness, vertigo, nausea, vomiting, and fatigue. This is also accompanied by neurological problems, convulsions, and even bipolar disorder. Prolonged exposure and inhalation of lower concentrations of the chemical can lead to bronchitis, pneumonia, and Parkinson’s Disease. In liquid form these fumigants and pesticides irritate the skin, causing itchiness and inflammation, and blisters can appear during the hours following contact. Respiratory and neurological effects have also posed a major concern, as well as the potential for causing kidney disease. While there haven’t been cases where long-term exposure to low levels of these chemical have resulted in major damage to the human nervous system, laboratory tests on rabbits and monkeys have caused moderate to severe injuries. For the growers, the only thing that matters is the production of strawberries at the cheapest price possible. The growers have ignored the warnings made by several scientists, instead preferring to use these pesticides indiscriminately so that they can continue making billions in profits at the expense of the health of those of us who live, eat, and spend time near the strawberry fields. In Oxnard and El Rio, millions of pounds have been applied on an annual basis… and the amount has been growing. 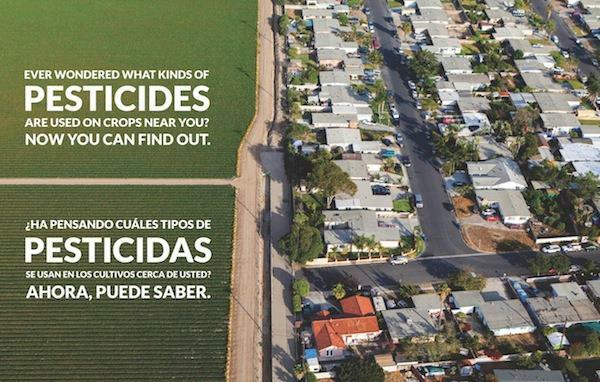 Since growers in Ventura county have been the greatest users (and abusers) of these deadly pesticides in the entire state of California, we have launched an information campaign. For far too long, the authorities have been silent about the invisible danger that these toxic chemicals pose to our neighborhoods, our children’s schools, and our environment. Instead, officials at all levels – from the state capitol in Sacramento to the City of Oxnard – have been complicit in a situation where our health is sacrificed for a profitable multibillion dollar industry based on exploitation and abuse of farm labor and the use of chemicals which should be banned. We demand that the authorities investigate and end the use of these pesticides, and inform our neighborhoods of the physical damages that we have been exposed to for several decades. This entry was posted in Análisis // Analysis, Luchas sociales y solidaridad // Social Struggles & Solidarity. Bookmark the permalink.